The recent rains have further delayed the completion of the Jourdanton Sports Complex swimming pool. City Manager Kendall Schorsch hoped that the pool would be ready for the summer. “While the pool construction may be completed, we need to make sure that the pumps, drains and all that goes with it, is working,” said Schorsch. Roads and other infrastructure also need to be completed before the public would be able to fully use the pool. Schorsch also added that a soft opening for the pool may be held if it is able to open this season. The Pleasanton pool officially opened yesterday, Tuesday, June 7. It is located in the Pleasanton Athletic Complex park at 1414 Downey St.
Summer hours of operation are Tuesday through Sunday, 8 a.m. – 10 p.m. It will be closed on Mondays for maintenance and for designated time reserved for pool rentals and aerobics. Pleasanton resident rates are: 4 years and under -$1; 5 years to 17 years – $2; 18 years to 54 years – $3 and Seniors 55 years and up – $2. General admission rates are: 4 years and under -$1; 5 years to 17 years – $3; 18 years to 54 years – $4 and Seniors 55 years and up – $2. 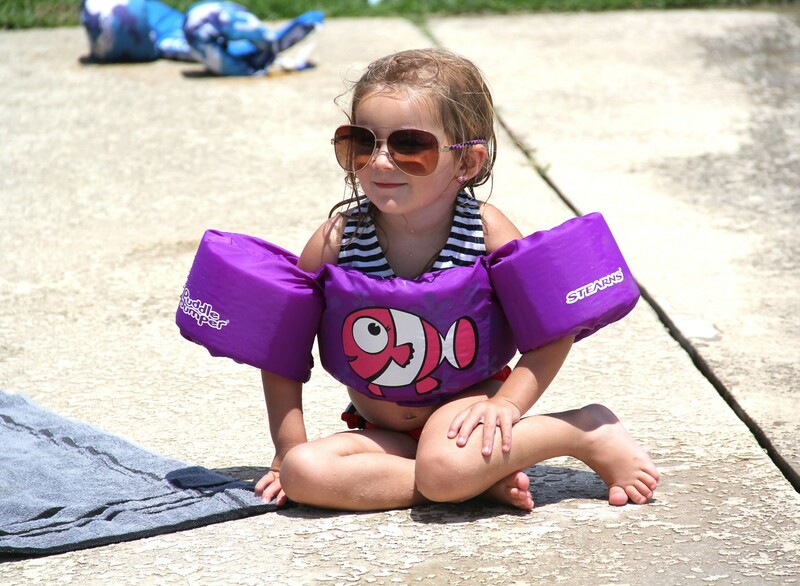 Swimming lessons are available Tuesdays through Fridays; 10 a.m. – 11 a.m. or 11 a.m. – 12 p.m.
Fees are $50 per two-week session, payable at the Pleasanton Civic Center. Ages 4 years and up (for 3 year olds please contact the Civic Center). Classes for water aerobics will be held Tuesday, Wednesday and Thursday from 8:30 a.m.- 9:30 a.m. and 6:00 p.m.- 7:00 p.m. The pool may be rented for private parties. Available times are Tuesday and Thursdays from 7 p.m. until 10 p.m. and on Saturdays 9:30 a.m. until 12:30 a.m. or 6 p.m. until 10 p.m.
Fees are $100 plus a $50 deposit for two hours. Three hour rental is $150 plus $50 deposit. Additional hours are $50 per hour. The fee includes two lifeguards for 50 swimmers. All reservations and payments must be made at the Civic Center one week in advance. Items allowed for parties under the awning are: food, chairs, drinks, tables, ice chests, tents, radio and decorations. BBQ pits must remain outside the fence if charcoal grill is used. Non -Styrofoam toys are allowed. No alcohol, no glass containers and no water balloons are allowed. For further information, contact the Pool at 569-3996 or Civic Center at 569-5904. Kadi Wilson (left), eight, jumps in the Pleasanton Pool to kick off her summer while two year old Khloe Roberts (above) sports her big sunglasses while soaking up the delicious sun. 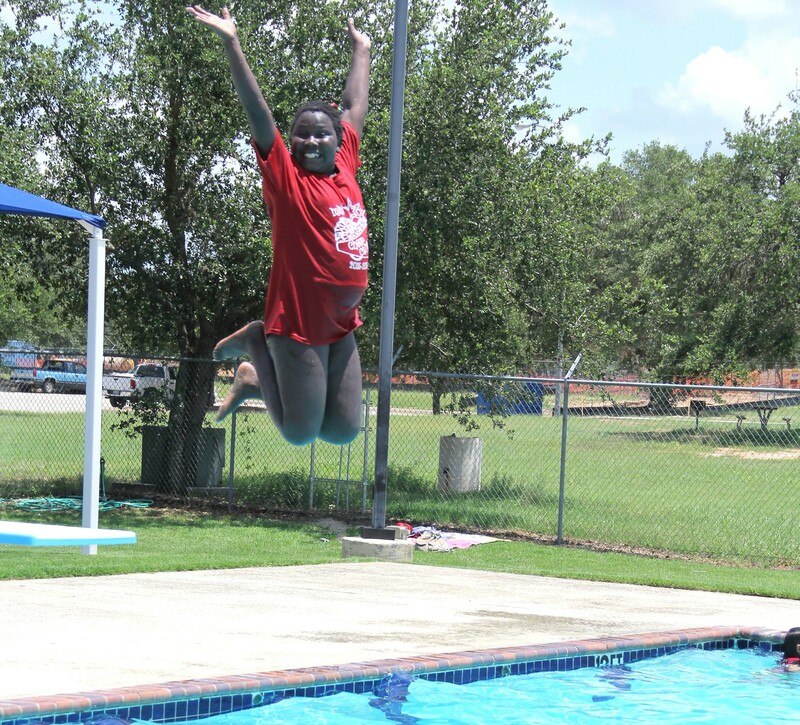 The Pleasanton Pool officially opened on Tuesday, June 7 for all to enjoy.